In the next part of Resurgence, the forces of Green and Blue receive some interesting new tools to present to their opponents. One of these new tools is the Chrysalis. 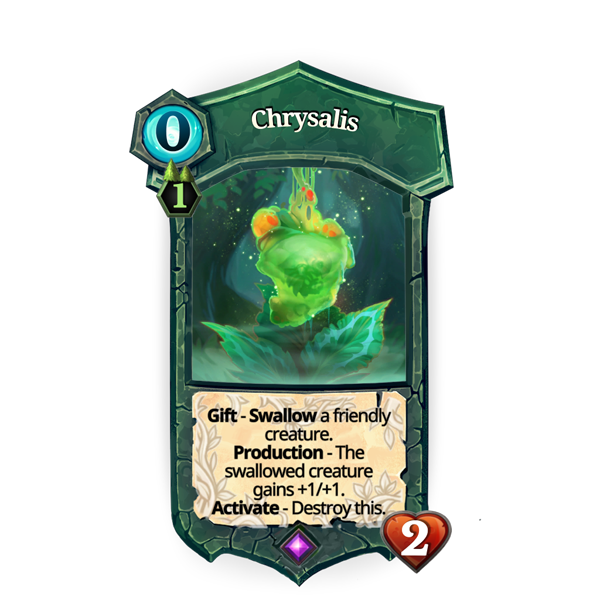 Chrysalis allows you to incubate one of your creatures in a protective shell, growing them as time goes on. You choose where to capture it - and when to release it. The next part of Resurgence contains 20 additional cards and releases October 23rd! We'll be sharing another card on a brand new community podcast next week, The KrogCast. Hosted by FrostyReindeer with Werfs and matrien, keep an eye on that Twitch channel for their first broadcast next week! Next week we plan on issuing a small balance patch in order to address a few issues we've observed recently. Here's the heads up! Deck building too stressful? No problem. Whether you're looking to have some fun or maybe receive a bit of inspiration, this deck randomizer has all kinds of settings you can adjust to get the result you like. The last chance to earn FWC points in the Season of Khalim is this Saturday! Once September ends, the top 32 players will be qualified for the Khalim Seasonal Cup - which will take place Saturday, October 27th. The Seasonal Cup will be scheduled slightly later in the month than normal in order to coincide with the release of Resurgence: Part 2. We're very much looking forward to see how the best players in the game compete with Resurgence completely available. The first Seifer Opens will be scheduled for the Saturdays October 13th and 20th. Two in a row! The current Ranked/Pandora seasons end this Monday - October 1st at 12:00pm (CEST). The FWC Points for this season reset will be the first points counted toward the Season of Seifer, which runs from October to December! 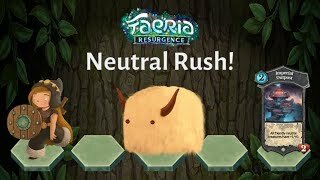 Once the Season of Seifer is complete we will mark the first year of the Faeria World Circuit. Happened so fast, didn't it? How big can you possibly build Kaios, Demented Overmind? Is your answer 275 or greater? Nice! You can win the competition. Click the image above for more information, and see if you can win. Miss the Half-Time tournament last Saturday? Use the power of the Imperial Outpost and throw bodies at your opponent's face until they surrender.